This memorial, built in 2013, is located in Winchester’s Jim Barnett Park. 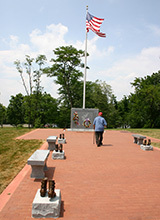 A walkway connects the POW-MIA Memorial and the Korean War Memorial and a brick “Path of Honor” leads the way to the large granite pieces and U.S. flag. Flanking both sides of the Path of Honor are five pair of bronze military boots representing the five military branches of service (i.e. Air Force, Navy, Army, Marines and Coast Guard).